This is a photo of John Unger and his dog, Schoep, who in this photo was 19-years-old and suffering from severe arthritic pain. Schoep (named after a popular Wisconsin brand of ice cream) and John have been together since John rescued the dog as an 8-week-old puppy. Schoep cowered in the corner of the cage at the animal shelter, and appeared to have suffered some kind of abuse. John showered him with love and brought the animal out of his despair and despondency; and Schoep would many times, through the years, return the favor. It was a bond like no other, and so many of us can identify with that spiritual love between man and animal. As the years progressed, Schoep developed a painful degenerative arthritis, but John couldn't afford a regimen of daily medication and treatments that cost as much as $200 a session. Instead, he would carry the dog into nearby Lake Superior each evening to ease Schoep's aching joints and help him fall asleep. 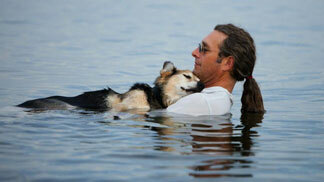 The buoyancy of the water soothed his arthritic bones. And because John knew that the end was coming quickly for Schoep, he asked a photographer friend of his to snap this one last picture of them together. The friend posted the photo on her Facebook page and the image went viral, receiving more than 2 million hits in a week! That's when the donations began pouring in. People from around the world wanted to honor the love between John and Schoep, and more than $25,000 was raised. John then established the Schoep's Legacy Foundation to help low-income families pay for their pet's medical care. "Literally overnight, I went to bed and the next day when the photo went viral, it was a whole new ballgame for me and for Schoep,'' said Unger. "It's still overwhelming for me in a sense. I knew the amount that was coming in would be way over the limit that Schoep was going to need for the rest of his life. I just thought, 'I have to give back.' "
Schoep was able to receive laser treatments and pain medication that reduced the swelling in his joints and allowed him to take walks, go swimming, and rest more comfortably. This last year was a Godsend for John and Schoep. On June 15th, Schoep turned 20 years old, a miraculous feat for the shepherd mix. Then it came ... John's Facebook post was short and heartfelt ... "I breathe but I can't catch my breath...Schoep passed yesterday." I know that there may be those of you who wonder why I would even comment on this story. But having known the unconditional love of a companion like Schoep, I felt the desire to honor this special relationship that I think comes straight from God. The love and trust and joy that an animal bestows on us is the picture of the relationship God desires with us, and that we would have with each other. No condemnation, wholehearted, unlimited, and unquestioning ... this is the compete picture of love. For just a moment, we can escape all the division and hatred in the world, and lose ourselves in the sweet, peaceful and tender image of Schoep in John's arms. I imagine that this is how God loves us. Rest in peace, Schoep. You have touched my heart and soul. thank you for posting this. this took place up in my neck of the woods, and it still brings tears to my eyes. God blessed us with animals...the unconditional love they give to us humans is a wonderful example of the love we are told to give others. John, as a fellow rescue dog(s) owner, my heart goes out to you. There is so much love in this single moment captured on film ... it is almost indescribable. And just like you, I can't lok at it without tears welling up as I remember the time I had to tell my Yellow Lab, Jewel, good-bye. God must love us a whole lot to let us experience this kind of love. They are the perfect example for us. Just wanted to add a thank you for this post. As with everyone, it does bring tears of joy and sadness to my eyes and heart. So glad that John was able to help Schoep and in turn gave John love. I truly love this beautiful, kind story and I am going to keep it close and will remember it always. I have a rescue Black Lab female that I saved along the road two years ago and I tried very hard to see if I could find her home, but no one claimed her. I was ready to place her in a loving home but decided that I couldn't because the bond I had with her at that point was too close. Everyone says that I saved her, but I make it clear that she saved me in so many ways and we're now inseparable! I feel the pain of the loss for John and I hope that in the future that he'll reach out again and find another special friend like Schoep and share that love once again. We can never replace our friends, but we can make new ones and be there in their time of need and share what love God has given us to share. Schoep will be waiting for John on the other side someday and they will once again be able to have a happy reunion! Those of us who have been blessed with God's gift of a loving dog can identify with this photo. The emotions it evokes almost cause pain; the love is so evident and if you've experienced it yourself then you can actually feel what John felt, holding his beloved companion and not wanting to let go. I keep returning to this photo because it reminds me of the ones I have loved and lost -- each one of them precious to me. And yes, I am one of those crazy Christians who thinks I will be reunited with them in Heaven. The love they have given me has to be straight from God, so it must return to Him, too, right? Thank you for posting this again. I seen this and the tears ran, and right now as I post to you, my eyes are welling up. God gave us animals to care for, look after, and help the earth, everything has a reason and purpose. I unfortunately, do not like the human race in any form except for certain people that I blog with or know in person. I am the rough around the edges Christian, I know that I am suppose to care for my fellow man, but I don't, especially now with everything that is going on in the world. It is certainly easy to become disillusioned with our fellow man; especially with the corruption, greed, and blasphemy that is exhibited daily. And, yes, animals give us love in the purest form, but please don't give up on man just yet. Remember that we are made in God's image, and perhaps He has given us the love of animals 1) to remind us that we are capable of feeling and showing such love, and 2) to give us a picture of how we are to continue to love, even when we (or others) fall short. Do you think that man has always shown perfect love to animals? Yet they never hold us accountable, and continue to nurture our souls with their unconditional love. I, am like you --- pretty fed up with the human race and the world, right now. But I think that God gives us images like Schoep and John to remind us to keep trying. It's not easy in today's world, but despair is the only other option, and I'm not ready to go there yet. Keep your chin up and keep looking up!